No way Id let my SK run around with this Ghey looking nosepicker. I dont care what the stats are. At level 65, this is a 1.53 ratio with a decent proc, already a considerable upgrade from the 'level appropriate' Elaborate Defiant Poleaxe with its ratio of 1.37 and no proc, and in fact still better than the Elegant Defiant 2HP that you can't even wield til 70. This 'nosepicker' grows with you, topping out at a ratio of 1.75 at 75. If the graphic bothers you (I don't see why-- It looks like a Narandi's Lance to me which I always thought looked pretty cool) you can use a Type 20 ornamentation aug these days and change it. I've noticed that most named in the expansion seem to drop two main items; one being the common and other the rare. This would be the common of the two drops. I've seen it 5 times for 5 kills, but can comfirm others saying that he also can drop the charm. I have also noticed that many of the items come in two versions. One with a Type 3 Augment slot and one without. So far I have seen no weapons with a Type 3 slot. For example, you have Watchful Eye and Eye of Roloff. 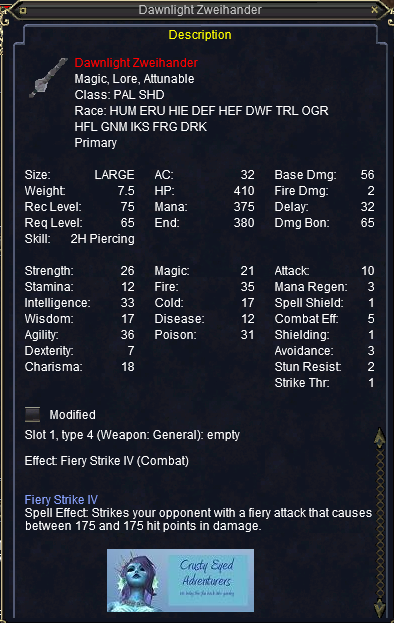 Same stats except that Eye of Roloff has a Type 3 Augment slot.